With architecture by T.S. 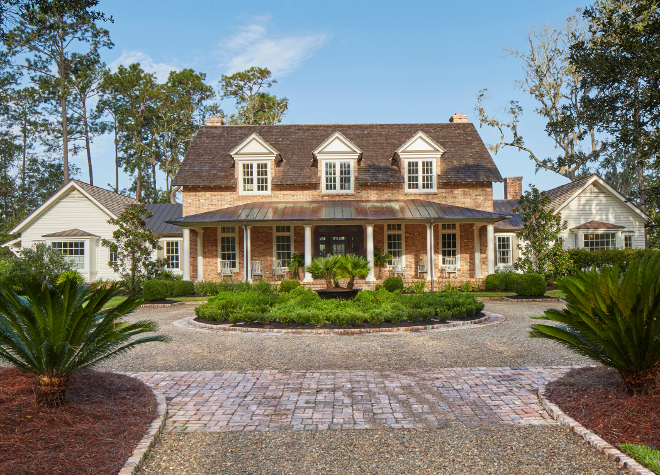 Adams Studio, Architects and interiors by Douglas Herrin Inc, this Georgian home is located in the Frederica Township community on St. Simons. 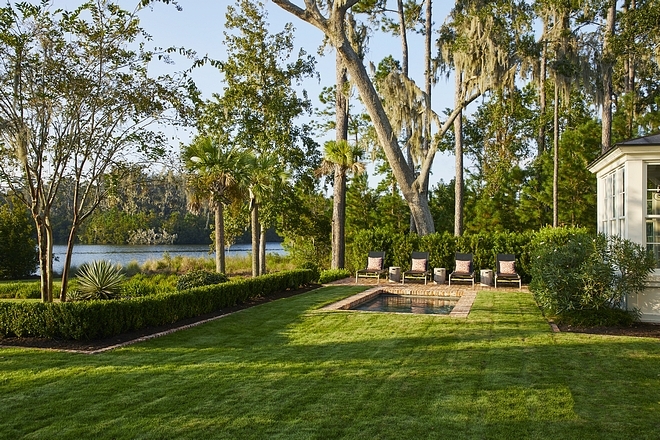 At 2 acres, this lakefront property is scattered with a mixture of planted pines and stately Live Oaks at the water’s edge. The finished floor was elevated 30” above grade due to a base flood elevation. The homeowners wanted a symmetrical house, sympathetic to the environment and location. 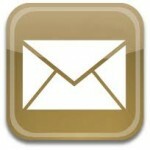 They also wanted it to respond to how they lived: not too formal and not too casual. The house has 6,222 sf of heated space with the day-to-day spaces on the ground floor and secondary bedrooms upstairs. Strong axial relationships between spaces and views to the lake are utilized throughout. Natural light and openness is a prominent theme as well. Ultimately, their design was a celebration of natural materials, paying tribute to the ageless beauty of the deep-south architecture that defines the region. The house incorporates many natural and reclaimed materials. The symmetrical main body of the house is a 1.5 story element with historical dormers bringing light into the upstairs bedrooms. Reclaimed brick and a buff mortar give a statement of authenticity. Lying in a flood plain, the house is raised 30” above grade, giving it a certain prominence among the pines and live oaks. Single-story wings flank the main body of the house to create a visually balanced elevation, while also mimicking older homes with their numerous additions over the years. 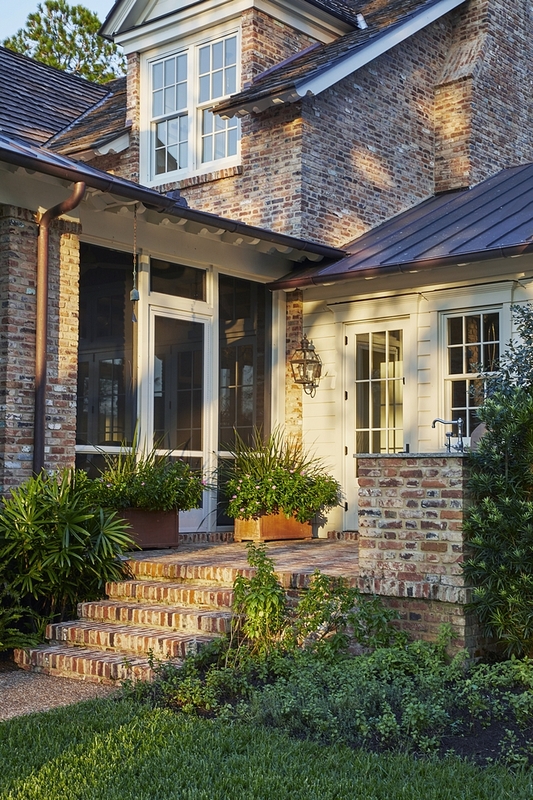 The wings transition to cedar lap siding and copper roofs, materials reflective of the deep-south architecture. Care was taken to integrate the home into its natural surroundings. 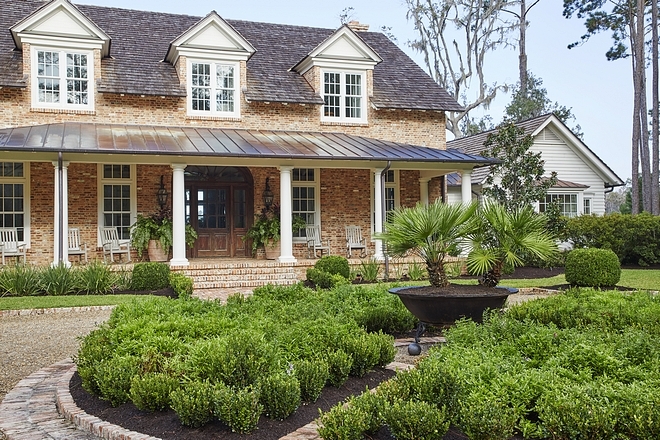 Traditional and reclaimed materials in conjunction with indigenous fauna landscaping creates a smooth transition between the built and natural world. 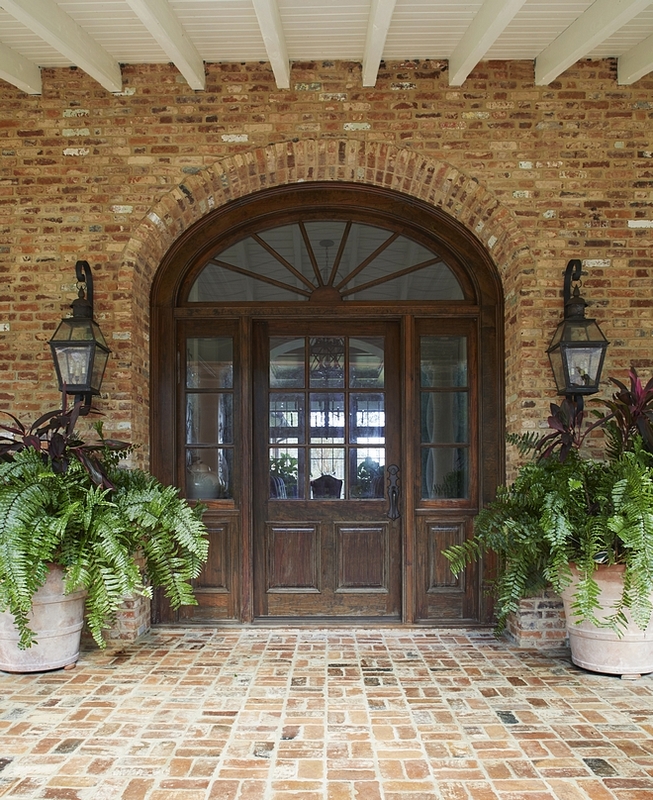 This oversized reclaimed Cypress front door, with an elliptical transom and sidelites, adds a traditional but casual element. Similar Terracotta Planters: Here, Here, Here, Here & Here. This long timber-framed front porch provides a comfortable, elevated view for greeting visitors, as well as protection from the coastal sun. 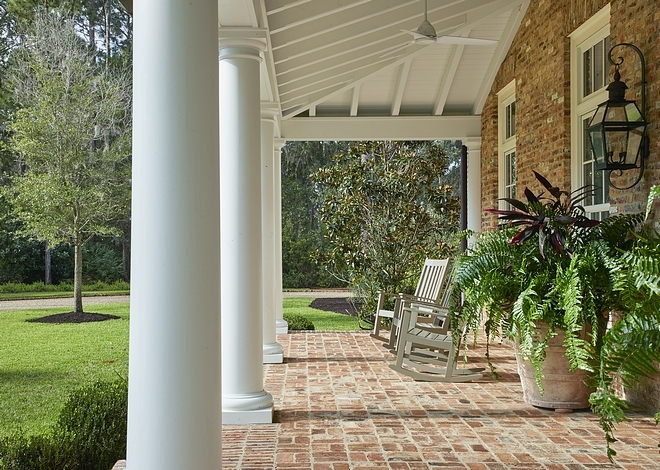 Porch Ceiling, Trim and Columns Paint Color: Benjamin Moore “Swiss Coffee”. Similar Porch Rocking Chairs: Here, Here & Here – These are dreamy: here. The foyer and dining room connect via an elliptical arch, creating a formal association between the front and rear while also allowing natural light to permeate throughout. Beautiful Pendant Lights: Here, Here, Here, Here, Here, Here, Here & Here. 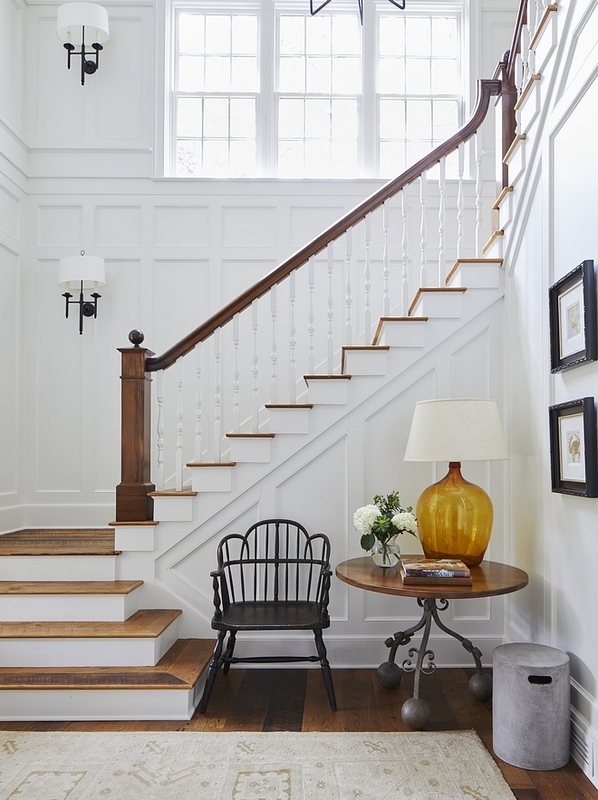 A cascading stair near the entry foyer opens up to the second floor with a triple-hung window allowing natural light to flood the space. Windsor Chair: Theodore Alexander – similar here & here. Lamp is made from antique wine bottle – similar here, here & here. Concrete Garden Stool: ADAC – similar here & here. Oushak Rug: Vintage – similar here (1 left and less than $150 :)), here & here. 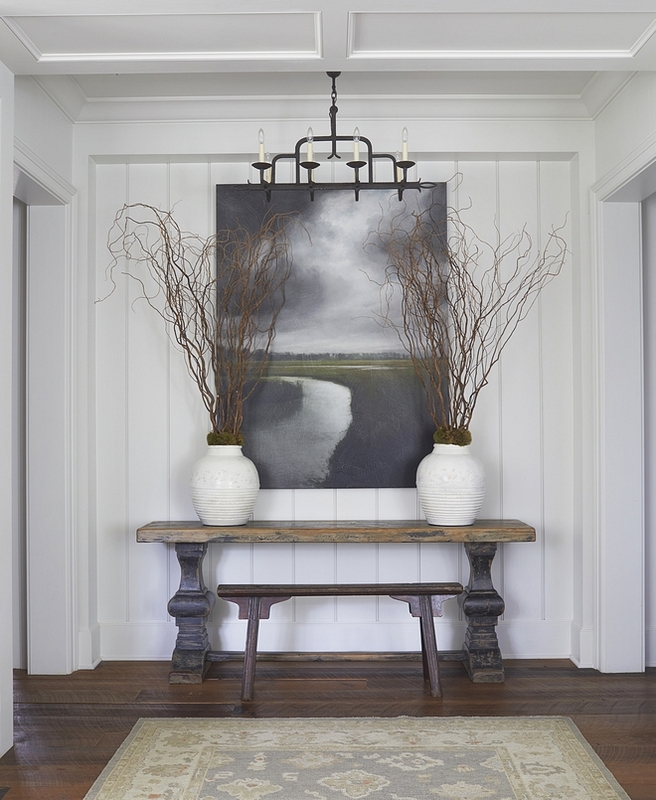 Painted wood and simple paneling create a subtle texture and warmth at the first floor walls. Similar Pendant Light (Larger): Here & Here. High, twelve foot ceilings create an open, airy feel throughout first floor. 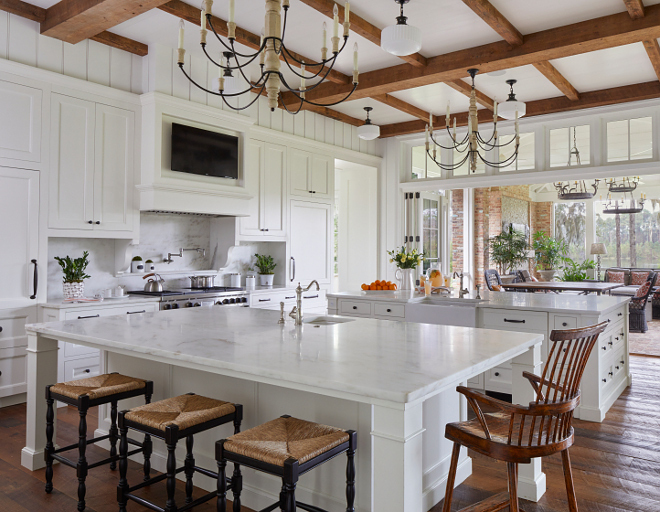 The kitchen, dining, and living rooms functionally flow together, but the columns and transoms visually distinguish each space. The transoms also recall old antebellum homes which used them for cross-ventillation. 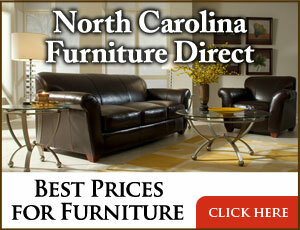 Dining Table: Custom – Beautiful Dining Tables: Here, Here, Here, Here & Here. Dining Chairs: Century Furniture – similar here & here. Wood & Iron Chandeliers: Custom – similar here, here, here & here. This has to be one of my favorite butler’s pantry ever! Isn’t it just perfect? The butler’s pantry features Rift Oak cabinet, Soapstone countertop, Soapstone slab backsplash and a custom natural stone farmhouse sink, also made of Soapstone. Flooring is reclaimed brick. Brick is laid in a basket weave pattern. Similar Chandelier: Here, Here, Here, Here, Here & Here. 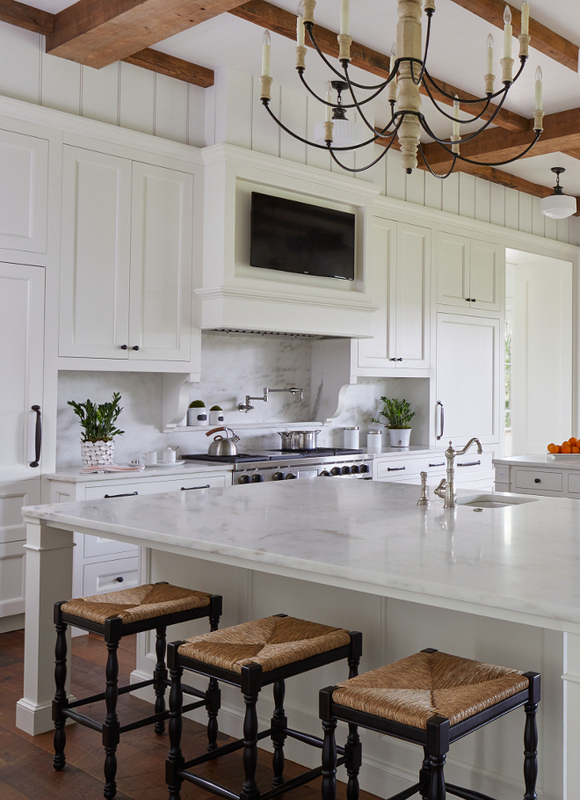 The spacious kitchen has two large marble-topped islands, perfect for entertaining. A sixteen foot bifold door opens to the screened porch, allowing the homeowners to take advantage of the breeze while also creating a seamless transition between inside and out. 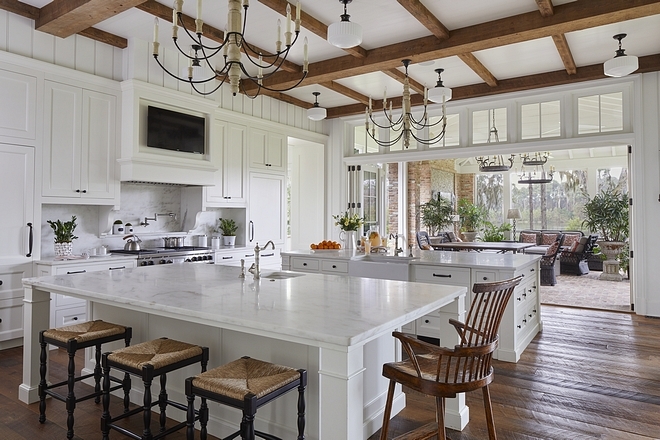 Chandeliers: Custom – similar here. Farmhouse Sink (not shown): Rohl – Bar Sink: Rohl. Wide-plank, reclaimed heart pine flooring carries throughout the home with occasional brick flooring in ancillary spaces. Notice the glass door leading to the pantry. Paint color is Benjamin Moore OC-45 Swiss Coffee. 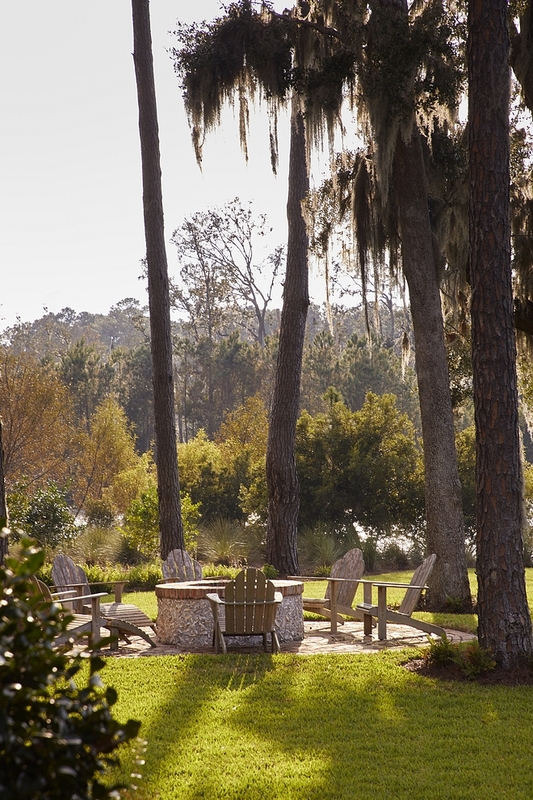 South Carolina style is characterized by a versatile mixture of formal and casual. 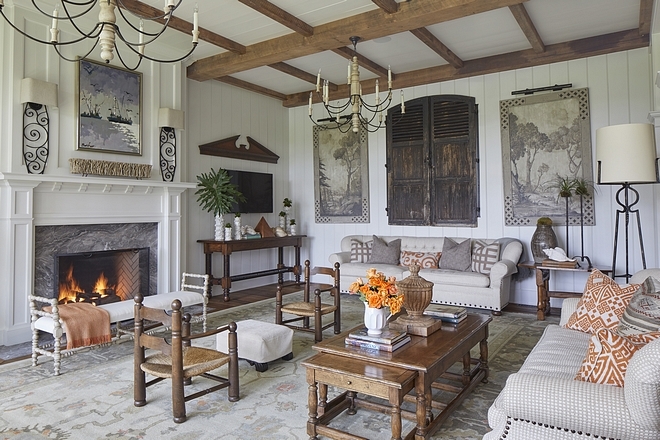 The clean, painted wood walls provide a casual backdrop, while reclaimed heart pine beams and flooring add natural warmth to the space. Similar Bench: Here. Other Beautiful Benches: Here, Here, Here, Here, Here & Here. An axial views creates a visual connection between the great room and master bedroom. Rug is one-of-a-kind – similar here & here (blue). 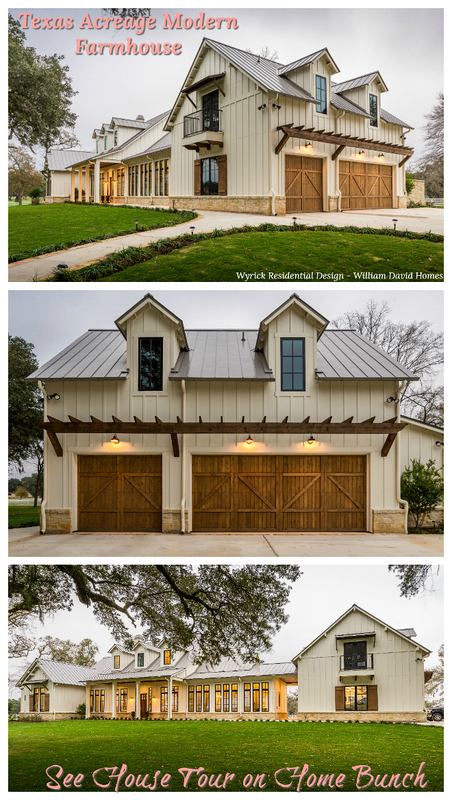 This honestly is one of my favorite homes I have shared on the blog in a long time. 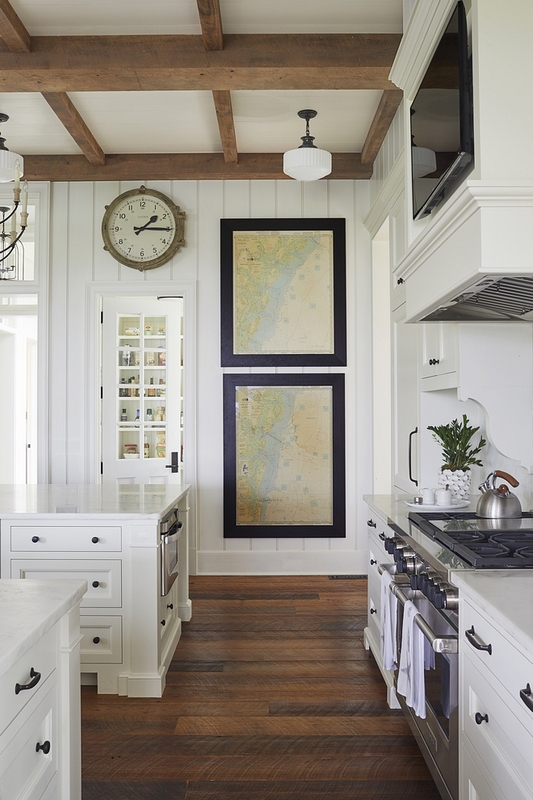 It’s wonderful to see interiors feel completely integrated with the architectural details, and this home offers that. The master bedroom has a vaulted ceiling and reclaimed heart pine beams to give the space a sense of scale. Bed: Century Furniture – similar here & here (lighter in color). Draperies & Bedding: Custom by interior designer – similar here (draperies) & here (bedding). Rug: Designer Carpets – similar here & here. The sitting area off the master bedroom has panoramic views of the lake and provides ample natural light into the master bedroom. Herringbone Floor Tile: Brushed Limestone from Walker Zanger – similar here. 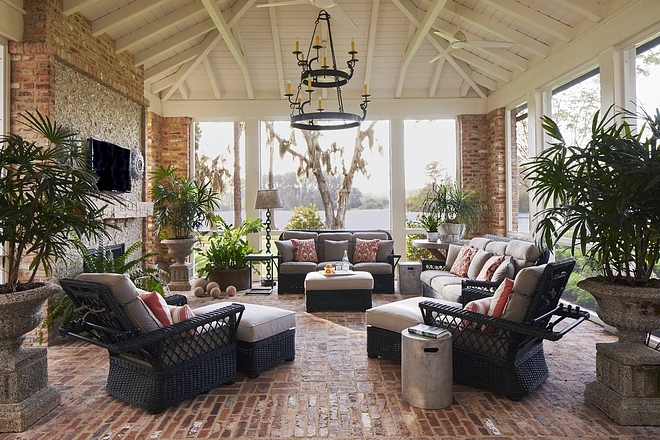 The timber-framed screened porch provides respite from the sun and bugs on hot summer days, while also providing an outdoor extension of the adjacent kitchen inside. 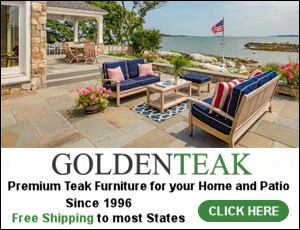 Outdoor Furniture: Lane Venture in Sunbrella Fabric – similar here, here & here. Chandelier: Masterpiece Lighting – similar here & here (All to be used in covered areas only). 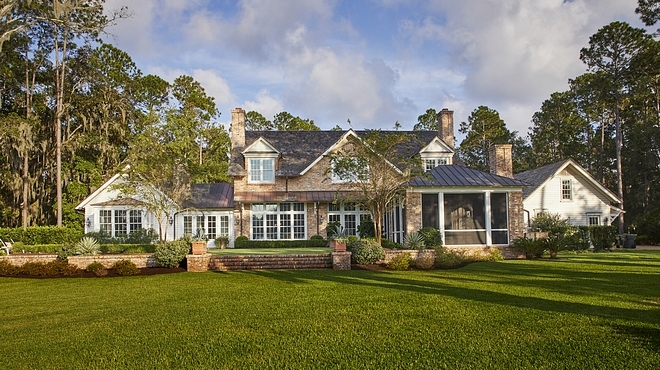 The rear elevation maximizes stunning coastal views with large windows and transoms. 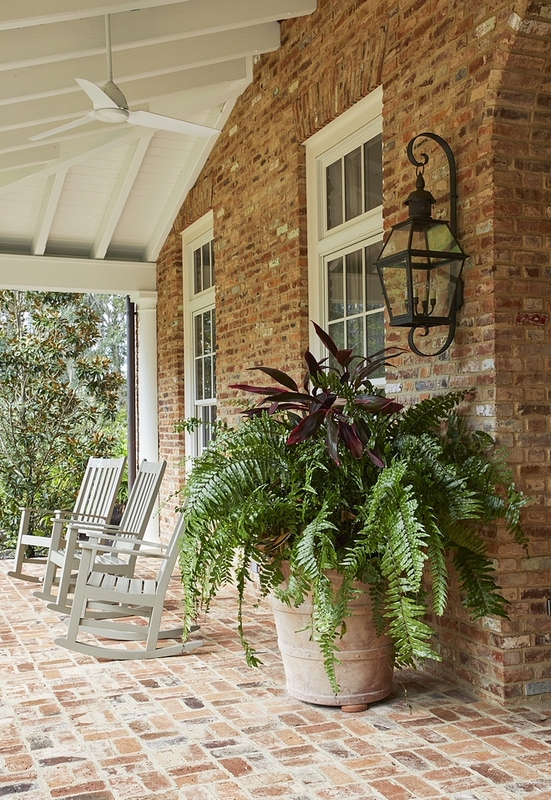 Traditional details like these ornate rafter tails and brackets speak to the low-country vernacular architecture. 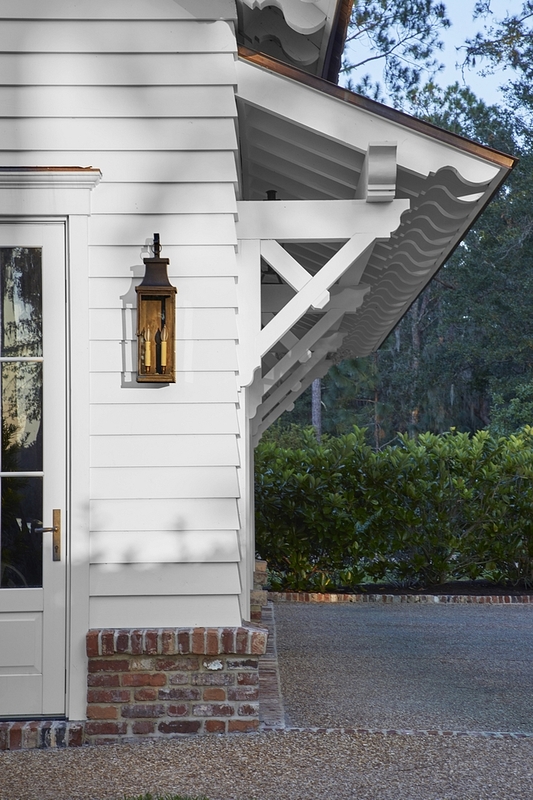 Similar Outdoor Lighting: Here & Here. The rear yard is a raised terrace flanked by a screened porch and pool, becoming a garden courtyard perfect for entertaining family and guests. Brick is Reclaimed Old Chicago brick with rough mortar. 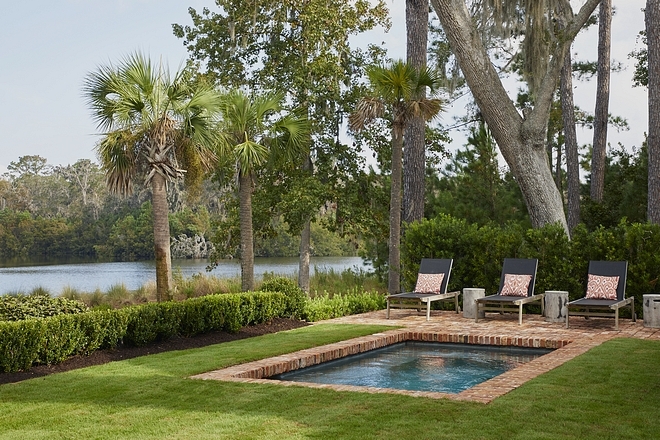 The grass carpet around the pool, combined with the waterfront views creates a casual environment which firmly places the home in its natural surroundings. The pool is surround by a brick boarder and a brick patio. Architecture: T.S. Adams Studio, Architects – Instagram. Interior Design: Douglas Herrin Inc. Photography: Jean Allsopp – Instagram. 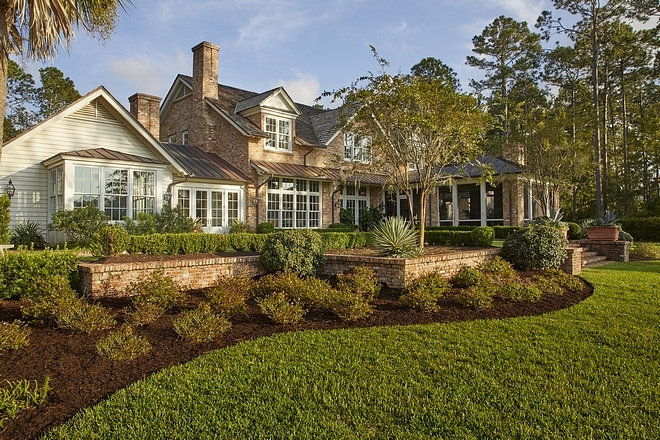 Builder: Rob Marett Custom Homes. Joss & Main: Once-a-Year Celebration! Up to 80% Off!!! 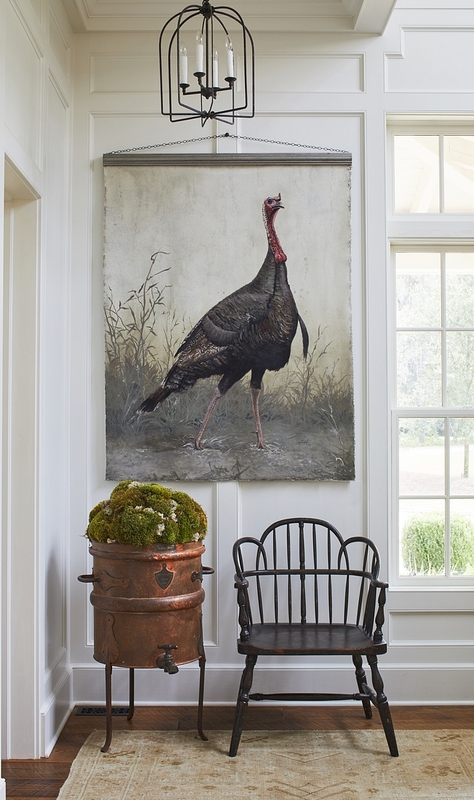 Wow, this Georgian home is a stunner! Thank you so much for sharing with us.